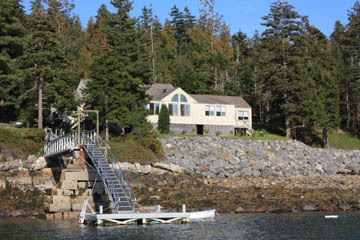 DESCRIPTION: Very private cottage with outstanding ocean views, dock, mooring and shared tennis court. 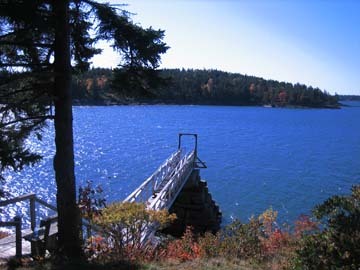 Located on Sawyer's Cove. LAYOUT: FIRST LEVEL: ONE LEVEL: Living room with fireplace and dining area, kitchen & laundry area. One wing has a bedroom with a queen size bed and bathroom with shower stall. Bedroom with twin beds and a full bath as well as an adjacent room with two sets of twin beds and a futon. This second room also has an unassembled crib in the closet There are 2 pack-n-plays and 2 high chairs in the closet on the right walking toward the w/d. Second wing, off living room, has a bedroom with a queen size bed and a full bath. Bedroom with twin beds and bathroom with shower stall.